The suspense of this movie is why do I keep watching it? This film is laughingly bad. Gloria Swanson looks like she's wearing a makeup factory. Charlton Heston wears some frightening looking outfits. 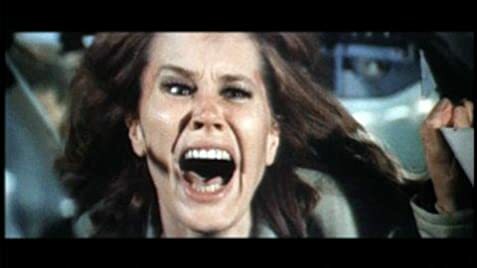 Karen Black, the best actress of the cast, is trying to take it all seriously but you know she's thinking "Just think about the money! Just think about the money!" The effects look like they were shot in someone's garage. George Kennedy says lines like "He dropped his old fashioned wrench," which are apparently supposed to bring down the house. Dana Andrews looks like he's incredibly bored. And Larry Storch in a serious role? Larry Storch? A mistake has been made here. Granted, the shots of the full plane in action are pretty good. But for all of this, I watch it, I am drawn to it like a moth to a flame every time it's on. I even bought the video tape. You know why? Because it's so bad it's good. Gloria Swanson's last line in the movie is the best. Why did they wait until her last line to have a good line in the movie? Myrna Loy is good - actually, she really shines with this crowd. Along with Airport '77 (1977) and The Concorde... Airport '79 (1979), this film was inducted into the RAZZIE Awards' Hall of Shame in 1983. Nancy Pryor: Salt Lake... Salt Lake! This is Columbia 409! It's Nancy Pryor... stewardess. Something hit us! All the flight crew is dead or badly injured! There's no one left to fly the plane! Help us! Oh my God, help us! During the 747's takeoff run, the flight engineer ('Erik Estrada') leaves his seat and instrument panel to help the pilot advance the throttles. In actuality, a flight engineer always stays in his seat during takeoff and closely monitors his instruments in order to detect any malfunction or emergency condition during this critical phase of flight.